Small Wood And Metal Xylophone is a great sounding simple inexpensive xylophone with 8 tones. 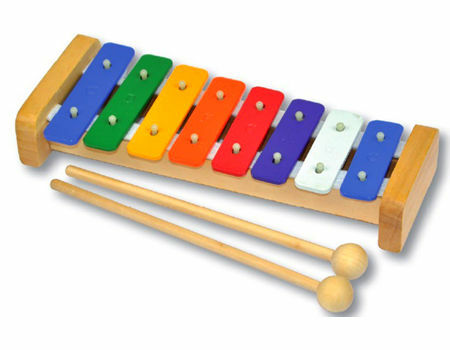 This Xylophone is well made and comes with 2 beaters. This xylophone progresses from lowest to highest over 8 metal notes and has a pleasant in tune tone. For the price this is a remarkable little xylophone and highly recommended. We like this because: "In tune and simple"